This class will move participants forward in their ability to begin pots on the wheel and then shift to the table for alterations with thrown and hand-built parts. A determined focus on handles and spouts will help participants build confidence with those challenging attachments. Study how the personality of a pot can be influenced by the decisions you make about lids and feet as we consider issues such as proportion, volume, balance, and scale. Examining images of historical and contemporary work will back us up in our own spirited exploration in the studio. Although pieces will be bisque-fired only, demonstrations and discussion of surface treatments will include the use of line and texture on wet clay, various resist techniques of slips at the bone-dry and bisque stages, and glaze choices for wood, soda, and reduction firings. Basic throwing skills are necessary for this workshop to allow for some flow to the process. *All of these items are available for purchase in the Shakerag store. I go to my studio to explore the possibilities for expressing what I find moving and beautiful in life through the making of functional ceramics. This provides an opportunity for quiet dialogue with myself and a sense of accomplishment through disciplined practice and hard work. Ultimately it allows me to offer something to others that may form a connection of a very special nature: a hand-to-hand exchange quite personal and affirming in a world full of experiences that often trigger feelings of isolation and anonymity. My primary materials are porcelain clay, kaolin slips, and a small number of glazes, and I fire my wood-burning kiln approximately 6 times a year. Most of the pots are wheel-thrown, frequently altered out of round, with thrown and hand-built additions. I approach each piece individually and allow myself time to explore its potential as an expressive object. Details added to the surface through “punctuations” of bits of clay, incising, slip trailing, and other mark-making techniques both decorate and personalize the pot. Various resist techniques provide for the layering of slips and glazes to create distinct boundaries or fields of color and texture. Wood-firing tempers my tendency toward refinement, and contributes richness and wide variation to the surface that continually surprises and delights me. It is the final, essential ingredient in my process. Charity has been a full-time studio potter since earning her MFA from Southern Illinois University Edwardsville in 1997. In her home-based rural studio she focuses on limited production porcelain functional pots which are fired in her Bourry-box style wood kiln. 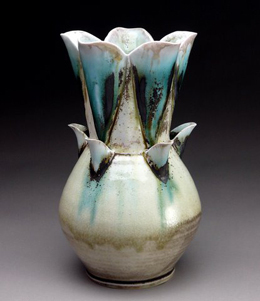 Charity has taught workshops for clay guilds, universities, and craft schools such as Anderson Ranch and Arrowmont, and her work can be seen in numerous publications and at exhibitions and gallery events around the country.